You value meeting others with empathy and compassion but find it is not so easy. Perhaps you find yourself getting caught in arguments, trying to fix things for people, or maybe you just feel uncomfortable not knowing what to do. Sometimes you find yourself listening to the same complaint or difficulty from the same person many times over. You would like to help, but you also don't want to be held hostage in repetitive conversations. Listening with empathy does not mean being a silent hostage. Listening with empathy can be an active and engaged process. You can learn to interrupt repetitive or escalating conversations in a way that leaves the other person feeling heard and that moves the conversation forward in connection. This course series is designed for anyone wanting to meet others with compassion and empathy while staying grounded in yourself. You will enter into a safe and supportive environment to learn and practice. You will have the opportunity to come together with a group of others who share your values and commitment to growth. You will notice that when an entire group brings forth this clear intention and dedication, a synergistic field is created that makes it easier for you to do the work you want to do. You will work with examples from your own life. This means that you get to decide the level of vulnerability you will bring to each exercise. Exercises are structured so that you can challenge yourself and, at the same time, maintain mindfulness and learning. The focus is on empowering you to interrupt shame, to engage compassion for yourself, and to stand firmly in a sense of your inviolable worth. For each class, there will be an introduction to concepts and skills, practice time in structured exercises within pairs or small groups, and whole-group questions and discussion time. Class size ranges from 8–14 students. Each class contains students completely new to Wise Heart and students who know each other and me from previous classes. An online eight week series is offered each quarter of 2019. What does it really mean to listen with empathy? Practice putting on new ears and learning to listen for feelings and needs. See how much easier it is to not take things personally when you can listen for the feelings and needs behind what someone is saying. You will be introduced to the definition of empathy in the framework of Mindful Compassionate Dialogue. You will learn 12 essential aspects of empathy and how to identify what is often confused with empathy. You will have an opportunity to name what gets in your way of offering empathy. Building a vocabulary for empathy: Part of learning to give and receive empathy is learning a vocabulary. You will learn some common "faux feelings" that can lead empathy astray into blame and shame. You will engage in exercises to help you learn the list of universal needs as a living language rather than a concept. 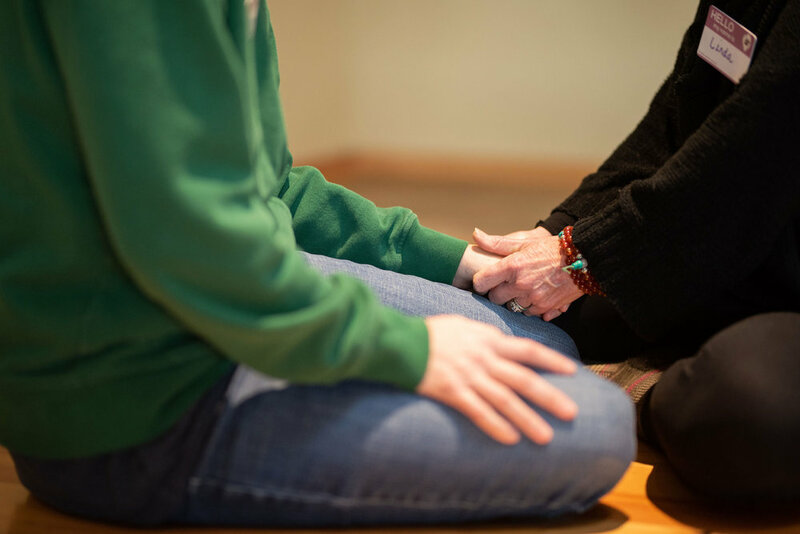 The experience of giving and receiving empathy: When you engage empathy mindfully, you will find that there many layers of experience to notice. Empathy is a state of consciousness and a generosity of the heart to be practiced and received with grace. Obstacles to empathy: The obstacles to empathy are predictable. You will identify a common list of obstacles and name the ones that most often get in your way. You will have an opportunity to develop and engage practices to work with these obstacles. Setting boundaries with empathy: Empathy isn't always the best response. And, sometimes, you don't have the resources needed to offer or receive empathy. You can't truly engage with empathy unless you can also set a boundary. Losing yourself in another is not empathy. You will learn strategies for discerning when you can truly give empathy and for how to set a boundary when you can't. Practicing with challenge: Being able to offer and receive empathy means being able to practice with challenge. This includes learning how to self-soothe and engage in self empathy in the middle of a challenging dialogue. Deep empathy: For relationships in which you need healing, deep empathy is often an important part of that healing. Deep empathy doesn't require the other person to be present for you to access it. You will learn a specific way to go beyond the simple empathic strategy of guessing feelings and needs. For live attendance of classes, we will begin with five minutes of guided meditation. I will then present a particular concept and skill. There will be an opportunity for questions or requests. Then, you will practice the skill in a short, structured exercise in either pairs or within a small group or the whole group. Exercises can be modified to give you more or less challenge depending on your learning edge. You may also engage in role plays. There will be an opportunity for a debrief and questions after each exercise. Students will be signing in from their own location in real time, at the same time. We will be able to see and hear each other in little boxes on the screen. For visibility, it's important to have a light in front of you, not behind you. The technology allows for breaking up into pairs or small groups, which I can visit and check in with just as I would do in an in-person course. It's okay to miss one or two classes in a series. You will receive a recording of the class and be asked to view it and do the corresponding exercises before the next class. Students won't be shown on the recording. You can also opt to take the series only through the recording and to participate in discussion via the online format. With the online format you can participate in a weekly discussion with all students I recommend that you find someone to do the course exercises with if you are receiving the recording. You will receive a detailed workbook as a part of the class, which you will need to have with you for each class. This workbook is packed with information and contains instructions for each experiential exercise. Attending at least six of the eight classes. Arriving on time to each class (2:30 p.m. PDT). Attending and participating for the duration of the class (2:30 p.m.–4:30 p.m., with a 10-minute break in the middle). It is very disruptive to come in and out of a single class session; please plan to attend by recording if you cannot stay for the full two hours of the class. Consistent access to internet speeds and connectivity that support video conferencing (600kbps/1.2Mbps (up/down) for HQ video; 1.5Mbps/1.5Mbps (up/down) for gallery view). Facility with using the Zoom video conferencing system. Please ask to consult with one of the staff members at Wise Heart if you are unsure about this aspect of your attendance. Logging in each week using the initial instructions and meeting ID # you received before the start of the course. Optional participation in the weekly online discussion with all students enrolled in the course. As self-paced participants, you will receive an extensive workbook as well as access to the video recordings of each session within 24 hours of the end of the session (4:30 p.m. PDT). You can ask to be assigned an empathy buddy to work with if you like. Questions regarding the material, recordings, and practice each week will be answered by LaShelle via email correspondence. Please place the word QUESTION in all caps in the subject line so that we can track them and respond in a timely manner. For more technical information about zoom, you can go here.